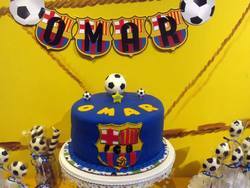 Omar was turning one and his parents wanted to plan a soccer-themed spectacular. 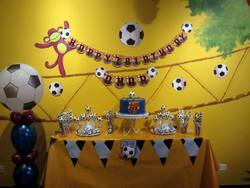 Mom and Dad's favorite team is Barcelona, so we were tasked with bringing a festive, European sports vibe to our Chicago playroom. As always, baker Joanna was up to the challenge. Accented by a fabulous banner from Claudia, a fondant, Barcelona-themed fondant cake was flanked by edible soccer-themed creations, including dipped pretzels, chocolate lollipops, and dipped oroes. 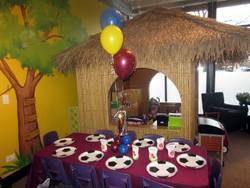 Rosie provided spectacular soccer columns and "1" centerpieces. The family also wanted a little extra-special entertainment from their favorite music school, Bucktown Music. Miss Patty (not pictured) joined us for singing, dancing, and musical games, perfect for the one-year-old set. All in all, it was a huge win! Thanks for celebrating with us, Omar! Happy Birthday!